Have I ever confessed that behind the bulky incorrigible baker lives a veteran fighter who has never managed to win the battle of the bulge? Temporary triumphs yes, but never lasting success. For all that love for desserts and good food, I try hard to keep our daily grub fairly healthy. I like to indulge my family with treats now and then, but am mostly the wicked mother and heartless wife who plays spoilsport quite often. All in the interests of our long term health and food habits of course! Store bought junk earns frowns mostly, but I give in sometimes, they sneak them in at times thanks to the hubby and the grandparents. Deep frying is really rare - I just don't enjoy slaving over hot oil ! Eating out very often is a no. The very selfish baker that I am, most of the big calories and fat are reserved for my bakes which I try hard to space out. My deep rooted love for conventional baking makes changes for better health all the more necessary. While I may not be the most health and nutrition conscious person around, I do keep trying constantly to make our meals healthier, strive hard to strike a balance. My exasperated family naturally has little choice but put up with me as I happen to be the sole chef around. If it helps resurrect my image, yes, I do feel guilty about it - at times! I have thankfully realized that home made junk is a lot more healthier than the store-bought or processed 'health' or 'low fat baked' goodies. Home made, low-fat baked versions naturally do not taste exactly the same as the 'regular' ones, but good enough. Hopefully will help the kids develop a taste for these as well, learn that this is the only way to have their cake and eat it too. 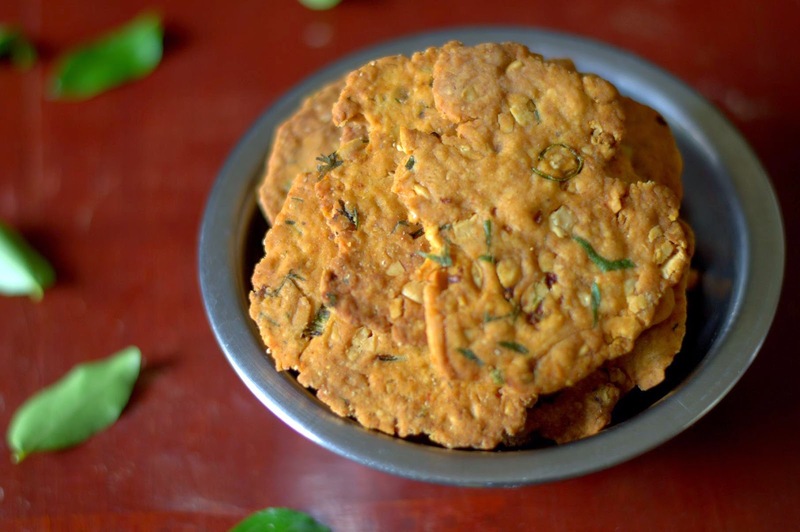 My family loves Nippattu, South Indian style deep fried savory crackers. I baked a healthier version of these and was quite pleased with the results. About 50% whole wheat and 40 ml oil for 18, 3 inch crisp crackers. Not bad I think! 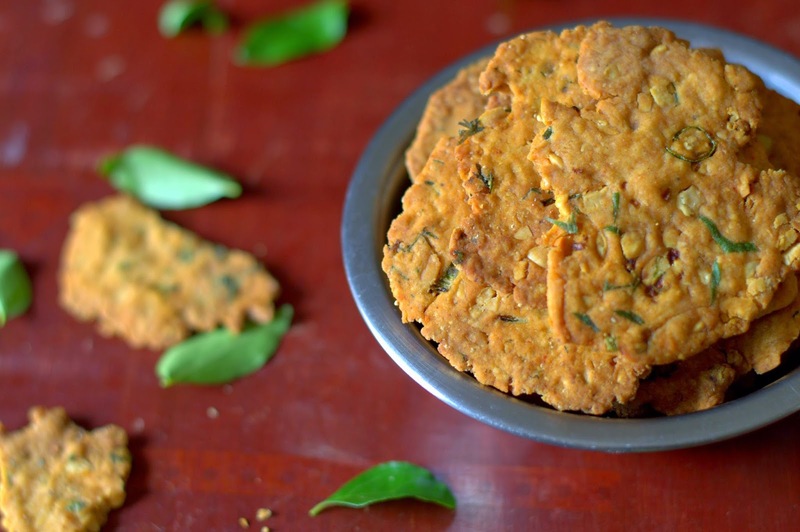 This is my crazy version of these crackers, play around with the flavors as you please! Method : Mise en place. Pre-heat oven to 200 C / 400 F. Line your baking tray(s) with parchment. Sift together the flours, baking powder, salt, chilli powder and sugar into a medium sized mixing bowl. Mix in the peanuts and poppy seeds. Warm the oil with the minced garlic. Do not let the garlic brown. Add the finely chopped green chillies, saute a few seconds. Let the oil cool to room temperature. Mix this with the water, stir in the curry leaves and coriander. Make a well in the flour mixture, tip in the wet mixture. Bring it together gently with your hand, knead 4- 5 times. The dough need not be completely smooth. You want a soft but not sticky dough. Add more water if needed just 1/2 teaspoon at a time if the dough feels dry or is not coming together. Divide the dough into 18 equal portions, shape them into balls. Lightly flour your work area. Roll out the balls into 3'' circles about 3 mm thick, placing the rolled discs on the lined sheets as you go. A small bench scraper works great to lift the rolled crackers without tearing .Keep the rest of the dough covered as you work. Bake the crackers for about 12-14 minutes or till light golden all over. The time will vary depending on the thickness of the crackers and your oven. So watch carefully after 12 minutes, these will turn darker pretty fast. A small test batch will tell you the correct baking time. Brush the crackers with a tiny bit of oil when still hot. This is optional but good. Let the crackers remain on the sheet for a few minutes. Cool completely and store in air-tight containers. 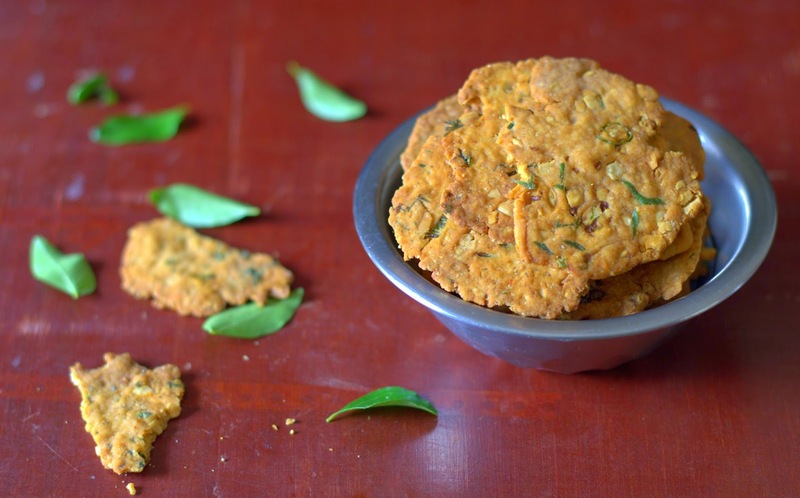 Skip the poppy seeds, green chillies and garlic. Add a generous dash of hing and 1 1/4 teaspoon red chilli powder to the warm (not hot) oil. Add 3 tablespoons shredded dried coconut to the flour. You could use finely minced onion, but you will need to saute them to remove moisture. Safe bet? Try this first as it is and then experiment. You can make this all whole wheat, you will need to adjust the water, expect crackers less light.